Now that triathlon season is past, for the first time since May I don’t have a cycle workout scheduled this weekend. If it weren’t for a few chores I had to do today, I would have squeaked in a 12 to 15 mile ride. Since I only had time for one workout, and the marathon is 11 weeks away, I ran for 70 minutes with the goal of keeping my heart rate in zone two. When I run from home, like I did today, I modify it to stay in my very low zone three at most. With the hills my run today had a total elevation gain of 300 feet. It is a difficult task to stay in zone two while jogging up hill. I wasn’t as fast as yesterday on the treadmill, but I was faster than Wednesday when I ran outside. My average heart rate was 135, just two beats above my zone two level. Results I am happy with. One thing that really made my run pleasant today was the temperature. It was quite mild, only in the mid 60’s. Autumn doesn’t officially begin until September 22nd, but it’s preamble is here – and quite welcome in my book. So with the changing of seasons, the end of triathlon season, and the beginning of autumn running – I am updating my blog to reflect my favorite season. The picture is of the lake I live on, a view I never take for granted. This picture was taken in 2010. 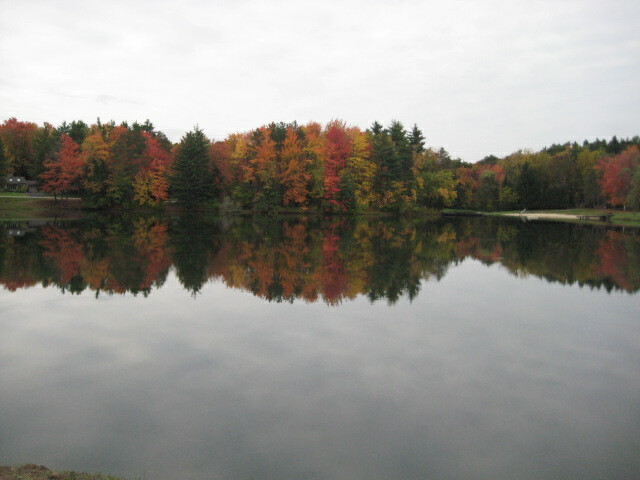 The leaves turn the most vivid colors in late October, so I have time before I will be able to take current pictures. For those who are reading this in email or on mobile, here is the picture I am changing to the banner of my blog. As much as I am a detailed person, I also appreciate the benefits of change. If I always did things the same way, life would be mundane. Changing up my blog appearance every quarter is just a little way to keep variety alive. Changing my training schedule is keeping me active and helping me improve. Some changes we create. Other changes are brought upon us regardless of our choices. Embracing the positive and making choices when it comes to the not so positive we have control over. One more way to seize the day. Beautiful view! I could look out onto that water all day. Thank you! My house is right across the street from the lake. Love the view. Absolutely stunning view. You are very fortunate to be able to see that every day. How wonderful. Thank you. It really is beautiful all year round.